Wonder Lake is one of the largest private lakes in Illinois with just over 800 acres of fishing and boating fun. The lake is stocked annually and includes large and small mouth bass, walleye and perch to name a few. 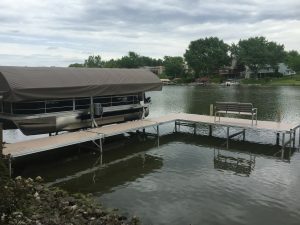 Wonder Lake docks and lifts by Metal Craft Docks have been installed and admired for more than 20 years. By contacting our authorized Metal Craft Dealer, BruceSki’s Marine Construction, you too can be enjoying your waterfront property to the fullest. Metal Craft Docks have been the preferred choice for property owners on Wonder Lake. Stationary or fixed piers perform well on this lake due to the average depth being around six and a half feet. Metal Craft Docks feature all aluminum construction with a superior non-skid, baked poly acrylic finish ensuring boaters safety as they enter and exit watercraft. Build the dock of your dreams with four standard deck widths, three standard lengths, and three color choices, to choose from. Contact BruceSki’s Marine Construction for assistance with your dock configuration. Metal Craft offers aluminum boat and PWC lifts for use with or without a Metal Craft Dock. Our vertical boat lifts accommodate watercraft up to 6,000 lbs. Metal Craft aluminum boat lifts feature a deep “V” design allowing entry to the lift in shallow water or deep water. Our side-trussed design provides extra strength while providing superior protection for watercraft. Standard features include stainless steel cables, nylatron pulleys, and zinc yellow coated fasteners. Additional accessories such as electric boat lift motors make operating your lift as easy as turning on your car. Deluxe bunks and guides and pontoon kits make docking easily even for the newest of skippers. Canopy covers offer additional protection for your watercraft and are available in many different styles and even more colors for that added personalized touch. Personal Watercraft Lifts or PWC’s are available in two models and will hold watercraft up to 1200 lbs. Our cantilever design allows for easy docking in the shallowest of water. A three-pulley system and galvanized aircraft grade cable require minimal maintenance. Metal Craft PWC lifts feature the Dutton-Lainson winch for smooth lifting and the Lorenz 26″ wheel makes for a smoother operation. Optional accessories include a winch post extension kit and Lift Tech Marine DC-100 battery power motor. Contact Ryan or Joel Bruce for assistance selecting the correct boat lift or jet-ski lift for your needs. BruceSki’s Marine Construction is a family owned and operated business. They have serviced the McHenry area for over 15 years. BruceSki’s Marine Construction specializes in making your waterfront lifestyle more enjoyable by handling all your marine construction needs. They are experienced in boat lifts, boat docks, seawalls, boat houses, dredging, and much more. Joel and Bruce grew up playing on the Chain O’Lakes…they live and work on the Chain O’Lakes… and no one knows the area better or has more experience building effective marine solutions in this area than BruceSki’s Marine Construction. Contact us at 847-366-4540 or email at joel@bruceskismarine.com and ryan@bruceskismarine.com.